I am blogging live today from an immigration conference at UNAM in Mexico City. Visit Immigration Prof Blog for the latest entries! 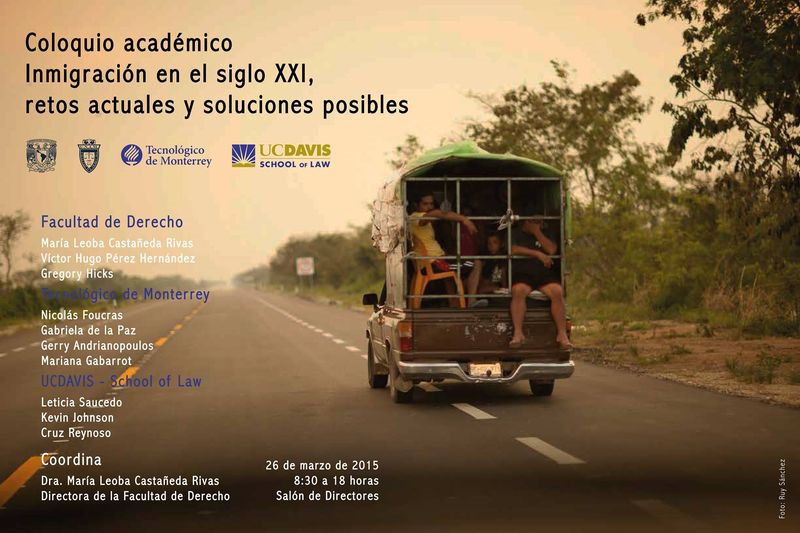 UC Davis School of Law, the National Autonomous University of Mexico (UNAM), and the Monterrey Institute of Technology are co-sponsoring an international conference on immigration at UNAM in Mexico City on March 26. I am joining immigration experts Professors Leticia Saucedo and Cruz Reynoso from UC Davis to participate in a conference with colleagues from Mexico's top universities to explore the history of immigration policy and law, the present context of immigration in labor and the environment, and the human impact of immigration on families, their daily lives, and their human rights. The program will also examine the future of immigration law and policy as it impacts both the United States and Mexico. Here is the schedule for the conference. 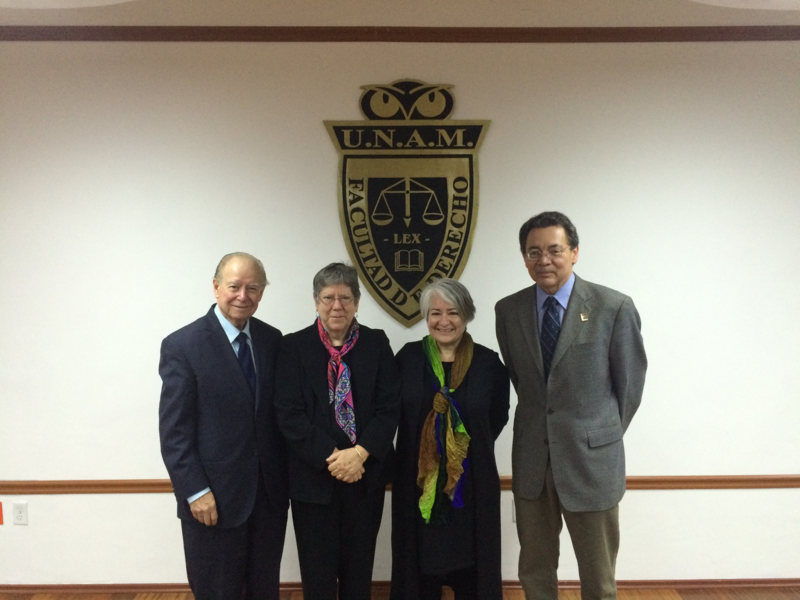 The Deans of the sponsor law schools (Dra. Maria Castaneda Rivas (UNAM), Kevin Johnson (UC Davis), and Gabriel Cavazos (Monterrey Tech)) will welcome the participants. Panel 1 is entitled "Overview, History, and Culture of Immigration." Panelists included Professors Nicolás Foucras (Monterrey Tech) and Gabriela de la Paz (Monterrey Tech). I am also on the panel and my presentation will focus on the history of immigration law and enforcement in the United States. Panel 2 ("Undocumented Immigrants in the US: Impact, Challenges and Enforcement") includes Professors Leticia Saucedo (UC Davis), Cruz Reynoso (UC Davis), and Gregory Hicks (University of Washington). Panel 3 ("Impact on Individuals") includes Professors Mariana Gabarrot (Monterrey Tech), Dean María Leoba Castaneda Rivas (UNAM), and Leticia Saucedo (UC Davis). Panel 4 ("Long Term Immigration Policy") includes Gerry Andrianopoulos (Monterrey Tech) and Victor Hugo Perez Hernandez (UNAM). I will discuss possible reforms to U.S. immigration law and policy. The conference follows an "Immigration Dialogue" for law deans from the Pacific Rim hosted by UC Davis School of Law in October 2014. The conference provided an opportunity for legal experts to explore challenging issues related to immigration as it impacts both countries. Beth Greenwood, Executive Director International Programs and the LL.M. program (UC Davis), and Concha Romero were instrumental in organizing the conference. Today, the California Supreme Court today issued its opinion in In Re Hong Yen Chang. The first line says it all: "We grant Hong Yen Chang posthumous admission as an attorney and counselor at law in all courts of the state of California." (emphasis added). More than a century ago, Chang was denied the opportunity to practice law in California because of his race. Professor Jack Chin, a leading civil rights law professor, has been working on the case with the Asian Pacific American Law Students Association students and the law firm of Munger Tolles & Olson LLP. Congratulations to all involved in this important effort to right a historic wrong. Congratulations, too, to the family of Hong Yen Chang, many of whom are lawyers right here in California. See coverage of today's developments from major news outlets including Reuters, Los Angeles Times, San Francisco Chronicle, and the Associated Press, among others. The U.S. Supreme Court last week heard oral arguments in an important case involving federalism and election regulation, Arizona Legislature v. Arizona Independent Redistricting Commission. As I have explained in a two-part series of columns (beginning with this one), Arizona is one of only two states (California being the other) where voters—responding to state legislatures’ tendency to engage in problematic gerrymandering—passed an initiative giving the job of drawing congressional districts to an independent redistricting commission (IRC) instead of the regular state legislature. The elected Arizona legislature brought a lawsuit and appealed the lower court ruling to the Court, arguing that the so-called Elections Clause, Article I, section 4 of the federal Constitution, which gives power to undertake districting in the first instance to the “legislature” of each state, prevents the people of a state from divesting the elected state legislature of district-drawing power. Many aspects of the oral argument weren’t shocking. I continue to believe, for reasons I explained in the earlier column, that the challenge to the IRC is flawed, but many analysts anticipated that the more conservative Justices would be sympathetic to the arguments made by the elected legislature, which is being represented by former Bush Administration Solicitor General Paul Clement, and these Justices did seem to be. On the other hand, some liberal Justices generally seemed more receptive to the arguments in favor of the IRC, made by its lawyer, former Clinton Administration Solicitor General Seth Waxman. Though expected by Court watchers, this coalitional breakdown is itself surprising in at least one historical respect: the liberal Justices seem more inclined to favor “states’ rights” by giving states latitude to experiment with different modes of district drawing, while the conservative Justices seem disinclined to permit states free reign. In the 1980s and 1990s, conservative Justices were the ones who generally thought the federal Constitution allowed for broad state experimentation, and the liberals thought that states did not have as much running room. But beginning with Bush v. Gore, it is now hard to know how the conservative/liberal framework (which is, of course, overly simple but nonetheless somewhat useful) maps onto federalism matters. We see the same potential complexity in the pending Obamacare case, King v. Burwell, where liberal rather than conservative Justices will likely construe the Affordable Care Act (Obamacare) in a particular way so as to avoid imposing costs on states that might not have been fully aware of the potential consequences of their decisions not to set up their own healthcare exchanges. In a few other respects, though, the oral argument in the Arizona case was surprising by any standard. For one thing, the Court included in the grant of review a question of whether the elected legislature had standing to sue (and the matter was briefed), yet the Justices asked no questions of Mr. Clement about whether his client did enjoy standing. There were some standing questions asked of the lawyer representing the United States (which supported the IRC as an amicus in the case) when he said he thought the elected legislature lacked standing, but one would think that if there is a question raised in a case about the plaintiff’s standing, the Justices would ask the lawyer representing the plaintiff to explain why the Court can hear the case. The burden to establish standing is on the party seeking to invoke federal judicial power, and yet the Justices gave Mr. Clement a pass on this in oral argument, even though the standing question is far from easy. (For an explanation of why the standing question is a complex one, readers may want to consult an earlier Verdict column focusing on that question). And when they did engage in the standing analysis at all, the Justices seemed not to know what they themselves had said in past standing cases, including a particularly relevant one. Justice Kennedy, in questioning the lawyer for the federal government, intimated that the Court’s cases do not say that just because another plaintiff might be a better candidate to bring a lawsuit, the Court should deny standing to the party actually in front of it. And the federal government’s lawyer acknowledged that the Court often says close to the opposite—that the “even if [the Court’s rejection of standing in a given case] would mean no one would have standing to sue, that’s not a reason to find standing.” But what both of them seemed to forget is that in the standing case most germane to the Arizona legislature’s dispute, Raines v. Byrd—where the Court denied standing to members of Congress in a case challenging the Line Item Veto Act—the majority did suggest that whether another party might be a better candidate for standing was a factor that might cut against standing for the members of Congress. As Chief Justice Rehnquist’s opinion put it: “We also note that our conclusion . . . [that Congresspersons lack standing does not] foreclose the Act from constitutional challenge (by someone who suffers judicially cognizable injury as a result of the Act). Whether the case would be different if . . . [this] circumstance were different we need not now decide.” The clear implication of that last sentence is that the existence of a “better” candidate for standing may very well affect whether the Court is willing to stretch standing doctrine for the sake of the plaintiff actually before the Court. This isn’t the only passage from previous cases that the Justices seemed to have forgotten they said. Justices Kennedy and Scalia repeatedly pressed Mr. Waxman for any instances elsewhere in the Constitution in which the Court had indicated that the word “legislature” was not necessarily a limited reference to the elected representative legislature, but could include the people themselves—the lawmaking authority. While Mr. Waxman had no clear answer, one thing he could have said is that Justice Scalia himself has intimated that “legislature” might in some constitutional contexts be read to include the people. In Salazar v. Colorado, in 2003, a case involving whether Colorado could involve state courts in discharging the power that Article II of the Constitution gives to “the legislature” of each state to prescribe the manner in which presidential electors shall be selected, Justice Scalia (along with Justice Thomas) joined an opinion, dissenting from a denial of certiorari, which said: “Conspicuously absent from the Colorado lawmaking regime, under the Supreme Court of Colorado’s construction of the Colorado Constitution to include state-court orders as part of the lawmaking, is participation in the process by a body representing the people, or the people themselves in a referendum” (emphasis added). With all due respect, Justice Kennedy’s historical account here is extremely and problematically simplistic, in that many states did effectively, to use his term, “displace the legislature” in picking U.S. senators. Beginning in the mid-1800s, state-level political parties and organizations sought ways to involve the people more directly in selecting senators, and were devising increasingly effective ways to limit state legislators’ discretion in their choice of federal senators. What evolved into the most sophisticated approach, the so-called “Oregon Plan” (or Scheme), began simply as an opportunity for state legislative candidates to formally pledge to follow the will of the voters, as expressed through an advisory popular election, when it came time to pick the next federal senator. The pledges were considered merely moral at first. But as other states began to follow Oregon’s lead, more creative and more coercive devices were employed. Nebraska, for example, pioneered a “scarlet letter” approach, in which elected legislators who broke the pledge they took as state legislative candidates were burdened with a ballot notation to that effect in the event they sought state legislative reelection. Other states followed suit, crafting variations on the Oregon and Nebraska devices to suit their local needs. Oregon voters ultimately adopted a state constitutional amendment that, as a matter of state law, legally bound state legislators to select the U.S. Senate candidates who were most popular among state voters. By 1912, when the U.S. Senate approved the Seventeenth Amendment, nearly sixty percent of the senators were already selected by some means of direct election (and thus had nothing to fear from it). For this reason, it seems likely that even without ratification of the Seventeenth Amendment, direct election would in fact be with us today in most, if not all, states. In reality then, the Seventeenth Amendment was a formalizing final step in an evolutionary process. Of course, the Oregon state constitutional provision binding state legislators, the Nebraska scarlet letter devices, and the somewhat similar measures from other states were never litigated in the U.S. Supreme Court or in lower courts. Yet that fact may itself be telling. Does Justice Kennedy think that these devices were in fact unconstitutional because they improperly deprived the elected legislatures of power Article I gave to them? If so, would Justice Kennedy be prepared to call into question the legitimacy of the senators elected from all the states that employed such devices for over a decade? And the actions taken by these Senates? And if not, doesn’t this historical episode support the Arizona electorate and its desire to experiment via the IRC? In deciding what the word “legislature” in the Constitution means, in Article I and elsewhere—and whether that term can be read to include the people themselves—the Court should, at a minimum, be more careful and sophisticated in taking account of what the Court or various of its Justices have said, and what the full historical record of American democracy reveals. 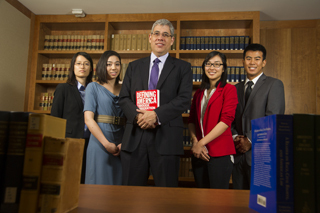 Last spring, ImmigrationProf reported on the efforts of UC Davis law students to seek the posthumous admission of Hong Yen Chang to the California State Bar. More than a century ago, Chang was denied the opportunity to practice law in California because of his race. Students in the UC Davis School of Law Asian Pacific American Law Students Association (APALSA) asked the California Supreme Court to admit Hong Yen Chang to the bar. Professor Jack Chin, a leading civil rights law professor, has been working on the case with the APALSA students and the law firm of Munger Tolles & Olson LLP. The California Supreme Court announced today that it would file an opinion in the case next Monday. Stay tuned! Among the most intractable debates of California politics is what to do about the California Environmental Quality Act, or CEQA, the 1970 law regulating the environmental impacts of development projects. Defenders hold it up as a crucial protection, while business interests and local governments are exacerbated by what they see as overly burdensome requirements and abuses of the process to block construction. Political forces as large as Gov. Jerry Brown have been unable to maneuver a comprehensive overhaul of the law. A day-long symposium hosted by the Environmental Law Society at UC Davis School of Law will explore the challenges and the future of CEQA. Kip Lipper, the Senate president pro tem's chief policy adviser on energy and the environment, kicks things off with a discussion of recent legislative developments. Sessions follow on nontraditional uses of CEQA, the implications of adding consultations with Native American tribes to the law, and how CEQA factors into the development of California's high-speed rail project and efforts to address climate change. Representatives from the California Air Resources Board, the Governor's Office of Planning and Research, and the Department of Water Resources are scheduled to participate in the symposium, which begins at 9 a.m. at the UC Davis School of Law. By Professor Darien Shanske. Cross-posted from SCOTUSblog. Neither side came away with a clear victory in the Court's decision in Alabama Department of Revenue v. CSX Transportation, Inc., as the Court remanded the case to the Eleventh Circuit. Again. The clear loser in the case is the Eleventh Circuit, which has been given the specific task that the court of appeals had already eschewed as "Sisyphean." Justice Scalia wrote the majority decision. Justice Thomas wrote the dissent, with Justice Ginsburg signing on. This is the second time that Justices Thomas and Ginsburg dissented on the same issue in the same case. The issue in the case was interpretation of Section 11501(b)(4) of the [4-R] Act, which prohibits a state from "impos[ing] another tax that discriminates against a rail carrier." Alabama imposes a general sales tax, which includes tax on the sale of diesel fuel to railroads, but motor and water carriers (i.e., trucks and boats) are exempt from paying this tax on their fuel. The Court held that the appropriate comparison class for assessing discrimination under the Act can vary depending on the alleged discrimination. In this case, the Court found that CSX properly alleged that motor and water carriers, as competitors to railroads, were a proper comparison class. The Court also held that "discrimination" in the statute requires some analysis of a state's overall tax system. It is not enough, as CSX argued, to look to the burden imposed by one tax in isolation when there could be another tax that demonstrates that there is, in fact, not an unlawful discrimination. It is true that only the railroads pay the sales tax on their fuel, but Alabama countered that this did not amount to discrimination because motor carriers, but not railroads, had to pay an excise tax on diesel fuel. The Eleventh Circuit refused to consider this argument, but it will have to consider it on remand as the Supreme Court has now held that the statute requires an assessment whether there is a "roughly equivalent" tax that offsets an apparently discriminatory tax. As for the issue of comparison class, oral argument already strongly indicated that a majority of the Justices were not going to accept the limitation on what can constitute the class that was proposed by the state and that had been proposed by Justices Thomas and Ginsburg in dissent the last time this case was before the Court. The anti-discrimination provision at issue is in subsection (b)(4), which does not explicitly state what the proper comparison class would be. However, subsections (b)(1)-(3) of the same provision do explicitly indicate such a class, namely "commercial and industrial" property. The majority found that this limitation does not carry over from the first three subsections to the last, primarily because the earlier subsections were specifically about the property tax and the final residual provision is not so limited. Once the Court found that this limitation did not restrict subsection (b)(4), the question becomes just what does constitute a comparison class. Here the Court provided only broad guidance. On the one hand, the analysis as to what constitutes a comparison class cannot be the same as would be performed in connection with the Equal Protection Clause. This is because, as to economic matters, the Equal Protection Clause permits very fine distinctions. As the Court explained, importing this analysis into the analysis of the 4-R Act "would deprive subsection (b)(4) of all real-world effect, providing protection that the Equal Protection Clause already provides." The right analysis as to proper comparison class must take into account the purpose of the 4-R Act, and here the opinion cites the statute: to "restore the financial stability of the railway system of the United States, [while] foster[ing] competition among all carriers by railroad and other modes of transportation." Given this purpose, the Court agrees that competitors, such as motor carriers, can be an appropriate comparison class. As for other possible comparison classes, the Court put that question to the side, exclaiming that "[s]ufficient unto the day is the evil thereof." As to how to do the discrimination analysis, the Court explained that "it does not accord with ordinary English usage to say that a tax discriminates against a rail carrier if a rival who is exempt from that tax must pay another comparable tax from which the rail carrier is exempt." In other words, how can there be an unlawful discrimination if in reality the railroads were no worse off than their competitors? The Court therefore "could not approve" the Eleventh Circuit's refusal to consider Alabama's argument that its fuel excise tax is the "rough equivalent" of its sales tax on diesel fuels. Though the Court was "inclined to agree" that this is not the kind of analysis that courts are likely to do well, it is nevertheless the duty of courts to try because that is the task Congress assigned them "by drafting an antidiscrimination command in such sweeping terms." Both as to the question of comparison class and as to the question of the scope of analysis, the Court's opinion adopted an interpretation of the statute that requires courts to apply broad standards. Justice Thomas in dissent does more than just argue for his reading of the statute; he also needles the majority about reaching a "predictably unworkable" result. A concluding observation. The dormant Commerce Clause also forbids discrimination in taxation, and thus the Court has already analyzed what constitutes discrimination in taxation at some length. And, in the dormant Commerce Clause cases, as noted very briefly in the opinion in this case, the Court has long accepted the possibility that states can defend themselves from a charge of discriminatory taxation by showing that there is some other compensating tax. By referring back to an early (1932) dormant Commerce Clause case, the majority opinion appears to accept that this piece of conceptual analysis is sound. Yet a lot has happened since 1932. In particular, the Court developed the so-called complementary tax doctrine, complete with its own three-part test, which has been applied fairly recently . The doctrine was also discussed in the briefs, including that of the United States, which appeared as an amicus in support of neither party. This is especially significant because the Court largely followed the disposition of this case proposed by the United States in its brief and at oral argument. What does it mean that the complementary tax doctrine made no appearance in the majority opinion? Rather than reference the doctrine, the majority used a form of the phrase "rough equivalent" twice, along with "roughly comparable," to describe what the Eleventh Circuit must assess. Is this standard stricter or looser than the complementary tax doctrine? Is this doctrine not mentioned because the Court finds it unsatisfactory or only applicable to dormant Commerce Clause cases? The opinion does not answer these questions, but perhaps we will find out what the Court thinks if - when? - this case returns to the Court for a third time. Co-authored with Dean Kevin R. Johnson. Cross-posted from Justia's Verdict. Over the next month or two, tens of thousands of admitted applicants will make decisions about which law schools to attend. 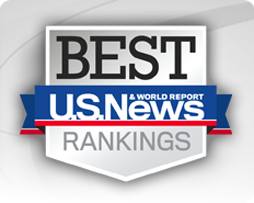 One tool that many will no doubt use to guide their decisions is the annual U.S. News & World Report rankings, which will be released in a little over a week. Many analysts criticize the methodology (or various aspects of it) that U.S. News employs to rate law schools (and some folks doubt whether all the nation's law schools could ever be meaningfully graded according to any single set of criteria.) But, for the time being at least, U.S. News remains the most looked-at, and seemingly influential, ranking system out there. For that reason, in the space below we offer-based on our collective experience in both evaluating other law schools and having our own law school evaluated-five pieces of advice for making the most sophisticated use of the rankings that U.S. News is poised to unveil. The rankings that are set for release on March 10 present a great deal of raw and processed information, but they data they contain-and the bottom-line rankings they assign-represent only a snapshot in time. Any sensible consumer of the rankings should look not just at one year's result, but at a longer track record, perhaps attaching more weight to a five-year average rather than to any single year's numbers. To be sure, sometimes there is, as to a particular law school or type of law school, a clear trend line-in particular components within the ranking or as to the bottom-line performance - and it may be important to try to discern what accounts for any such consistent assent or decline. More commonly, a school may bounce around somewhat because of short-term factors, such as a bad year in passing the bar and/or placing graduates in jobs, or an anomalous drop in application volume or quality due to some administrative gaffe or regional downturn. Such volatility is itself a basis on which the U.S. News rankings are often criticized-how much could a school's overall quality really change within the space of a year?-but taking a somewhat longer view may partially address that criticism and make the bottom-line ratings more meaningful. In looking at changes over time, it is important to realize that certain parts of the U.S. News evaluations very rarely move much from year to year. This would include a school's reputation rank among other law professors who are surveyed (which accounts for 25% of a school's overall ranking) and its reputation rank among lawyers and judges who are polled (which accounts for 15% of the overall result). The relative quality (compared to other schools) of a school's student body-as judged by median LSAT scores, college GPAs, and the school's acceptance rate-also has tended, as an historical matter, not to change tremendously in a single year (but rather evolves much more gradually), but this factor has itself become a bit more volatile in recent years as the national decline in application volume has hit some schools harder than others. Other factors, such as the percentage of graduates who are placed in law-related jobs at or nine or ten months after graduation, bar pass rates, and dollars-per-student spent by a school (more on that later), have tended to fluctuate much more, and thus may account more for the year-to-year changes in bottom-line rankings. In addition to being limited in time, the data that U.S. News employs and presents every year is limited in scope. Among the data that it ignores is how diverse a law school's faculty or student body is. We have argued (in an earlier series of online columns) that this information concerning racial/ethnic (and perhaps other kinds) of diversity ought to be incorporated into the rankings. Most law school faculty and administrators around the country believe that diversity within a school is a helpful plus in a world where graduates are going to encounter and serve clients of various different backgrounds. Yet U.S. News has declined to include a diversity component in its overall scoring (although it separately presents raw data as to racial diversity). As we have explained before, the main reason U.S. News has offered for not including diversity-that some schools are located in places where diversity is harder to accomplish-simply doesn't wash. Some schools are located in places where there are fewer high-LSAT performers in the community, yet we still include median LSAT as a rankings input because we think a law school student body's LSAT performance is a relevant characteristic. If, as the Supreme Court has held and as most people in academia believe, a diverse school is pedagogically better than a less diverse school, all other things being equal, then we should develop a way to have diversity count for at least something when we evaluate and rate schools. In the meantime, prospective students can find helpful data on each school at the ABA "Standard 509" website. While we are talking about the makeup of the student body of each law school (which many prospective students would find an important factor since law students often learn from, and are judged by the outside world by, the company they keep), we should point out that the data that U.S. News weighs most heavily-median LSATs and GPAs-while relevant to an assessment of student-body academic strength, itself can mask important differences within each student body. Two law schools may have similar medians, but they may have very different LSAT scores and GPAs at the 75th and 25th percentiles within their student bodies. Let us compare, for example, using 2014 data, Northwestern and Cornell, both excellent law schools with undeniably strong student bodies. Northwestern's LSAT median was a 168, and its median college GPA was a 3.75. Cornell's were a bit lower on both-a 167 and a 3.68. But Cornell's 25th percentile LSAT and GPA were somewhat higher than Northwestern's (166/3.55 compared to 162/3.53). How could the school with higher medians have lower numbers at the 25th percentile? There could be a number of possible explanations. Northwestern may prefer applicants who have either a very high LSAT or a very high GPA (sometimes known as "splitters"), whereas Cornell may prefer people who were reasonably (but not quite as) high on both metrics. Perhaps Northwestern's 25th percentile LSAT is lower because it has enrolled more students who have been out of college for a longer period of time, in which case LSAT scores may be less important than real-world accomplishment. Or maybe some different reason altogether. We are not suggesting here that having medians that diverge from a school's 25th percentile numbers is inherently problematic (although it might be problematic for law schools that, unlike Cornell and Northwestern, have many low LSAT performers and that may have low bar pass rates); instead, we are simply saying that when an applicant is looking at the student bodies of schools in which s/he is interested, it may make sense to look at more than medians. We note, in this regard, that the ABA "Standard 509 Report" website has a good tool that enables users to search and compare law schools along these axes. We should add that if critics believe that U.S. News creates a perverse incentive for schools to admit "splitters" (perverse in the sense that pedagogical considerations would otherwise incline these schools to admit folks who present reasonably strong LSAT scores and GPAs instead), there might be ways to tweak the U.S. News student-quality formula, but any such changes could create other incentives or disincentives about which other observers might complain. Two final observations warrant mention. First, one of the most volatile-and thus influential as to many schools' rankings in a given year-factors in U.S. News is the percentage of graduates who have a full-time, long-term, law-related job ten months after graduation. Certainly a school's ability to help place its graduates is an important factor in any decision about where to attend law school. But note, importantly, that the percentage employed in full-time, long-term, law-related jobs does not by itself convey any information about the particular type of jobs a school's graduates are getting. U.S. News does not present or make use of salary data (although it did decades ago); it does not break jobs down by geography; as of last year it did not even tell consumers how many jobs are funded by the graduate's law school or home university. We should add that some law school- or university-funded jobs are quite meaningful and reasonably paid, whereas others are less so. In any event, here too, the ABA provides much more finely grained data on job type and salary; applicants should consult the web page on which the ABA collects and presents the employment surveys for all ABA-approved schools. Finally, speaking of money, we should point out that there is one factor in U.S. News as to which the underlying data and the use to which U.S. News puts it are harder to see and thus harder to analyze, and that is the so-called "faculty resources" component that looks at "average fiscal expenditures per student for instruction, library and supporting services." This inscrutable factor accounts for about 10% of a school's overall score and often determines where a school lands within a bunched-up grouping. For example, if one looked at all the other major U.S. News components-peer academic assessment, lawyer/judges assessment, median LSATs/GPAs, acceptance rates, placement rates, bar pass rates, student-faculty ratio, etc.-Yale should be tied with, or even slightly behind Harvard. And yet Yale consistently beats Harvard for the top spot in the rankings by a non-trivial margin; last year it was four overall score points out of a possible 100. And this difference seems likely accounted for by the fact that Yale spends more-although precisely how much more is hard to know-per student than any other school by a significant margin. To say that expenditures-per-student can have these important consequences on a school's ranking and its yield is not to imply that this spending criterion is illegitimate. But one cannot help wondering: if the additional spending-per-student isn't elevating placement rates or lowering student-faculty ratios, or allowing a school to obtain a faculty that is seen by other law professors as superior to that of other schools (and all of these are already measured directly and counted by the ranking system), precisely why should the money matter so much? The U.S. News methodology may result in double-counting of many considerations, but dollars spent may be a particularly problematic example. Yet there may be responses: perhaps Yale's resources don't increase its placement rate, but affect the kinds of jobs its graduates are able to obtain. For example, maybe its resources allow more students to undertake their own original research, which leads to more jobs in the academy. And so forth. Again, as with most other features of the U.S. News rankings that we've discussed above, our goal here is not so much to provide definitive answers as to cause students to think a bit more critically as they consume the bottom-line ordinal rankings for which U.S. News is best known.